It's been a long week of sniffles and coughs over here, y'all. This sickness is making me long for cold weather even more. Too much couch snuggling and cozy clothes, I guess. It's been far too warm outside for me to actually break out any fall pieces long term, but I am always looking for new outfits to wear my favorite ankle boots with so I can sneak in a little bit of autumn wherever possible. I'm in the market for a new pair of black booties this fall and I'm really loving this zippered pair. I recently scored some gorgeous taupe booties at TJ Maxx and they are already on HIGH repeat! I think it's my mission to grab a pair in every shade possible. Do you have a favorite pair of fall footwear? Share it with us in the comments below! I want them all!! 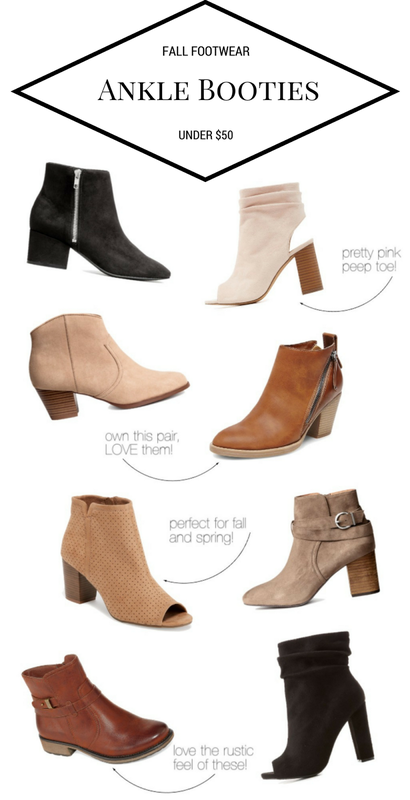 the peep toe booties are adorable! Those pretty pink peep toe I really need for this fall! Too cute! I love shoe shopping at TJ Maxx! Oh I am so ready for fall clothes and shoes! These are so cute!